Sharm el-Sheikh lies at the southern end of a 50km long coastal strip, which has been developed since the 1980 for international tourism. This is full of hotels, shops, restaurants, cafes and night clubs. There is no historic centre and in fact lots of buildings look quite artificial. 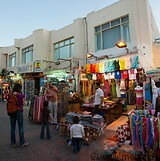 Naama bay is the centre for the budget oriented mass tourism and is full of shops and restaurants.